Joint boss Lee Baldwin is setting his sights on a Wick Football Club promotion push this season. 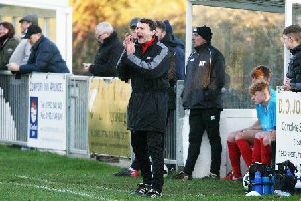 Former Littlehampton Town manager Ady Baker will work alongside Baldwin as Wick push for a top-three Southern Combination League Division 1 finish in 2018/19. Wick came up short in their bid to bounce back from SCFL Premier Division relegation at the first attempt last term, finishing fifth. Baldwin has focused on bringing in players with vast experience in over the summer. Ex-Littlehampton Town quartet Danny Hand, Dean Janman, Jack Cole and Jake Chaplin have joined while Curtis Horn and Lee Bradshaw are back at Crabtree Park following lengthy stints out injured. Joint manager Baldwin believes these additions will give his side a much-needed physical boost for the promotion push. Ash Hawkes (Arundel), Josh Irish (Rustington), George Cody and Ryan Barratt (Pagham) have all left the club. Wick get the SCFL Division 1 season under way at Storrington on Saturday.